Flagship Marine has teamed up with Faria Instrument Company to offer an array of instruments for both Inboard, Diesel, I/O, and Outboard Applications. Shown are a few models that we have in stock. Other Faria models can be special ordered upon request. Check out them out at Faria-instruments.com. Call for price and availability. Flagship Marine gets many calls asking why should I buy a Q-type of Spark Plug vs an L-type, and what is the difference? The following explanation provided by Champion Spark Plug Co. trying to explain why it is important to pick the correct spark plug and that not all spark plugs are created equal. We hope this information helps in making your decision eaiser. At the moment the spark jumps the gap it causes a high frequency burst of energy, this is known as RFI (radio frequency interference). 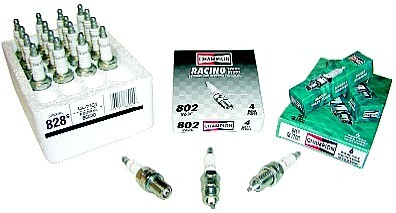 This is why Champion introduced resistor spark plugs in the mid 1960's. Placing a resistor within the spark plug suppresses the RFI. Without resistor plugs in your car you can experience static on your radio as well as interfere with other sensitive electronic equipment. Some later model vehicles as well as newer Powersport engines must use resistor plugs for a proper "talkback" to the electronic ignition. Outboard marine Capacitive Discharge Ignition (CDI) such as used on some Evinrude and Johnson marine engines require a special inductive type resistor (such as a Champion Q-type resistor). Use of non-inductive resistor type plugs on these motors can cause misfire and poor performance. For automotive CDI high output ignition systems (such as Mallory, MSD, Crane and Accel), refer to Resistor plugs for race engines for information relative to modified motors.